Kelly K. Burkhart was born and raised in Midland, Texas. He earned a Bachelor of Arts degree in Religion from Baylor University and a Master of Divinity degree from George W. Truett Theological Seminary in December 2004. While attending seminary, he was recognized and awarded as a Cooperative Baptist Fellowship Leadership Scholar. Kelly is currently working on a Doctor of Ministry degree at George W. Truett Theological Seminary and expects to graduate in May 2020. 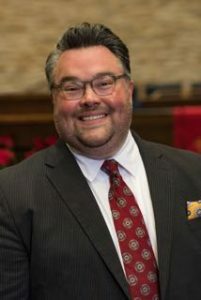 Kelly’s professional memberships have included service on the Cooperative Baptist Fellowship’s Coordinating Council; the Cooperative Baptist Fellowship Texas’ Coordinating Council; and Current, the young leaders’ network for the Cooperative Baptist Fellowship, for which he has served as co-chair. Kelly is currently serving on the Board of Directors for Baptist News Global and as the Moderator for CBF Texas (2018-2019). He was licensed to ministry by First Baptist Church, Midland, Texas and was ordained by Chalk Bluff Baptist Church in Waco, Texas. He has served as the Associate Pastor to Youth and Families at Central Baptist Church in Daytona Beach, Florida and as the Pastor at First Baptist Church in Riesel, Texas. He has served Baptist Temple as Senior Pastor since September 2004. Kelly and his wife, Shelly, married in January 1999, and have three children, Hudson, Aiden, and Bryn Abigail. 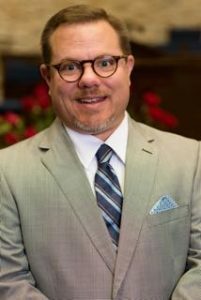 Edward Crowell is a fifth-generation native Houstonian, and has served Baptist Temple as Director of Music since January 2016. He previously served this church in a similar role from 2005 to 2008, prior to founding Imperial Arts, Fort Bend County’s resident professional performing and visual arts organization in Sugar Land, Texas. Edward is a graduate of Hardin-Simmons University where he studied applied voice performance and music theory and composition. He has performed as a soloist in opera and oratorio throughout the U.S. and Europe, and has served churches throughout Texas in music and worship leadership. He was licensed to ministry in 2004 and ordained in 2014. Edward is a member of Phi Mu Alpha Sinfonia, the Hardin-Simmons University Board of Young Associates, various professional and musical organizations. He lives in Missouri City, Texas with his wife, Robyn, and their family.